Carey's pet Keeshondens (they have four). 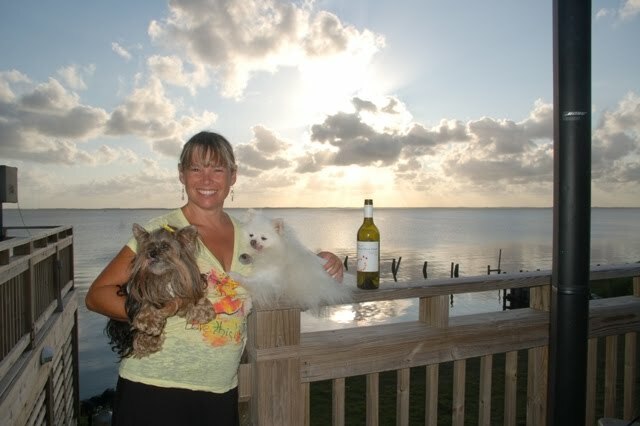 An absolute must for every pampered pup's OBX beach vacation is the weekly Yappy Hour at the Outer Barks. It takes place each Wednesday from 4-5:30. While there is no wine (enterprising humans have been known to BYOB), there are delightful Puppachinos and generous array of special doggie appetizers for the post-beach cocktail hour. Munchkin and Pomeroy adored the chicken and potato casserole with a touch of cheddar that hostess Robin prepared last week. On clear days, Yappy Hour takes place in the big yard behind Scarborough Faire, with pools for pups to splash in and hoops and agility rings to jump. 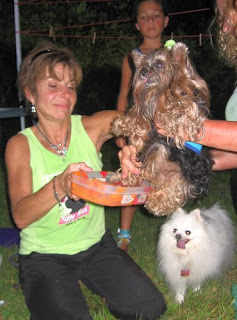 A favorite Yappy Hour activity among the four-legged crowd is the art. Who knew a puppy paw was a natural paint brush? 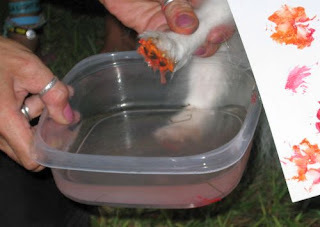 This year's colors were peppy orange and pink (water soluable for easy cleaning). 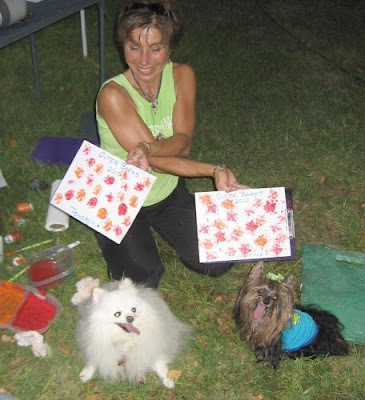 Both Wine Dogs left with full tummies and full confidence that their new masterpieces are destined for the walls of the Petropolitan Museum of Art. The Wine Dogs arrived in Duck on Saturday, just in time to enjoy a fabulous wine tasting on the inlet at Aqua S Restuarant. Munchkin and Pomeroy were thrilled to have their tasting personally hosted by their good friend -- owner and sommelier Lynette Sumner. 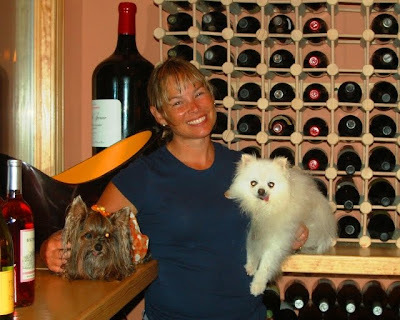 Lynette guided the Wine Dogs through a tasting of four of her favs. First up was Blue Ocean, a Vinho Verde from Portugal with a subtle effervescence -- not unlike Lynette herself. In honor of Munchkin's mom's trip to France this spring, Lynette followed up with the Domaine Cordier Pere Macon Aux Bois d' Allier 2006, with a lovely nose and a rich golden color. Switching to reds, Lynette brought out the Estancia Pinot Noir. 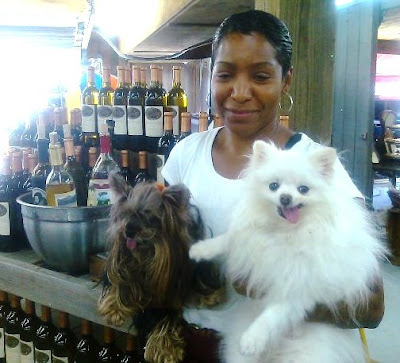 Served at cellar temperature on a hot afternoon, the wine earned two enthusiastic paws up from the Wine Dogs. The final offering was an Austrialian wine called "Duck, Duck, Goose." Lynette told the Wine Dogs she would have bought it for the name alone, but the Shiraz Cabernet blend proved an outstanding selection. 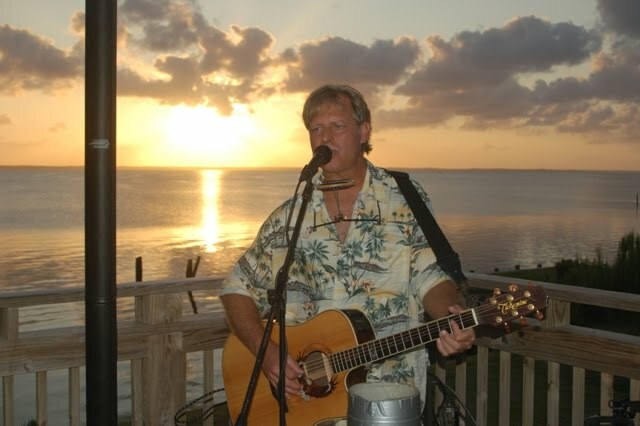 The evening was completed by a gorgeous sunset and the music of Buster B. Curtis, "Man Of A Thousand Songs." 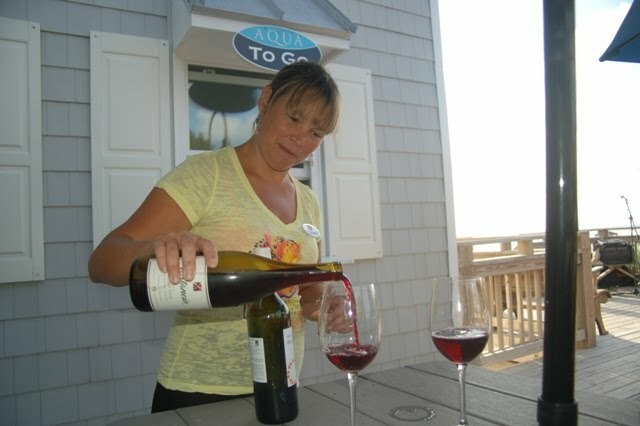 In addition to Saturday wine tastings, Aqua S features live entertainment on its sound-side deck nightly (except Sundays). Relax with a great glass or bottle of wine from Lynette's Wine Room. 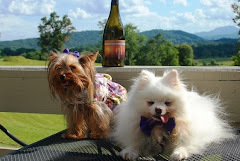 Even on vacation, Munchkin and Pomeroy continue their wining ways. En route to the Outer Banks, the Virginia Wine Dogs stopped at Morris Farm Market on Highway 158 to pick up fresh produce for the week. The roadside market has come a long way since 1982, when Walton and Ginger Morris started selling sweet corn out of the back of their old Ford pick-up truck. But in one since, it hasn't moved at all; it can still be found under the shade of the same two old pecan trees. Inside is an array of fruits, ciders, jams, fresh baked pies and breads, and ice cream churned by a tractor. As he rode up the aisles in his wheelbarrow, Pomeroy made a lunch out of the samples. Munchkin (who isn't much of a fruit and veggie fan), was sulking until she discovered Morris Farms also stocks -- and tastes -- North Carolina wines. 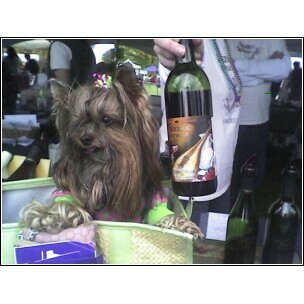 The Wine Dogs' new best friend Sophia poured them samples of several fruit wines, including a refreshing peach. 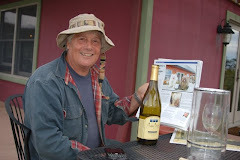 There was also a pleasant Chardonney among the offerings. 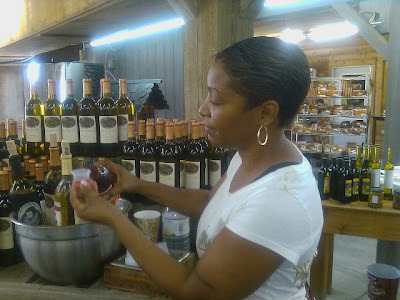 Most interesting were the muscadine and scuppernong wines, made from native grapes that thrive in the sandy soil and hot climes of the Carolinas. Indeed, these grapes were said to have nourished the settlers who landed on Roanoke Island. 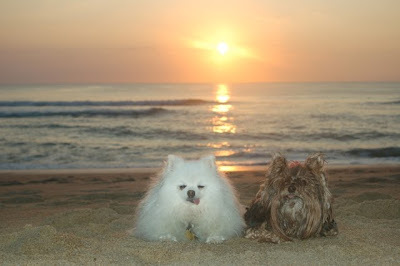 Munchkin and Pomeroy were quite distressed to learn that they could be enjoying the last of the scuppernong -- a sweet white just made for the beach. It seems the power company was overly zealous in May and sprayed the 400-year-old Mother Vine with a nasty herbicide. These are thought to be the oldest vines in North America. 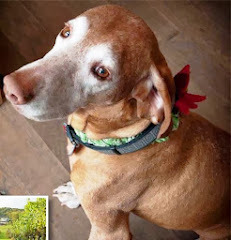 The Wine Dogs did a little more research and are able to report that, with much TLC, it looks like mama's coming back. 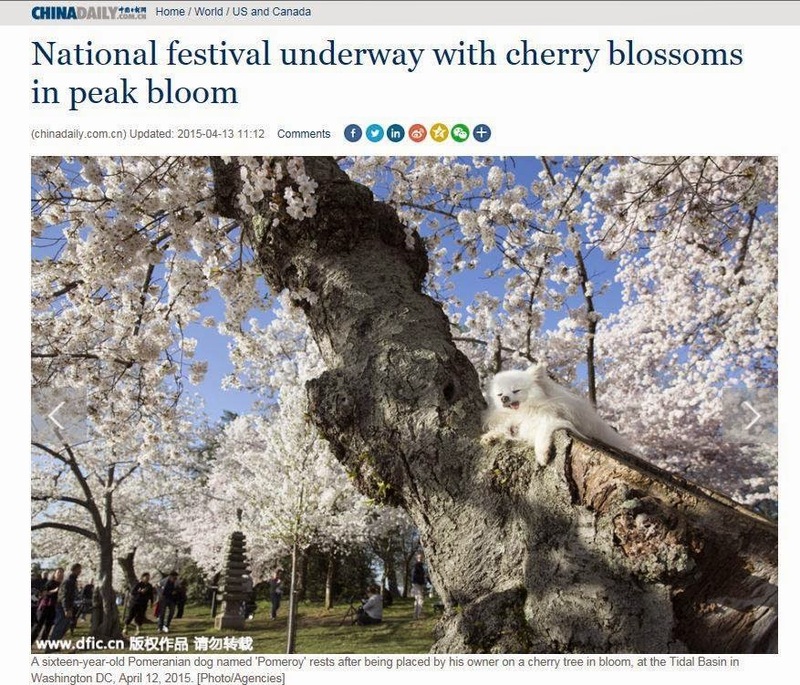 See related story. Ah, the Dog Days of Summer. Thanks to our friends at Narmada (via Wikipedia), we know that the name "Dog Days" (Latin: diēs caniculārēs) comes from the ancient belief that Sirius, also called the Dog Star, was somehow responsible for the hot weather. Munchkin and Pomeroy like to think of these hot, sultry days as "Uncle Jeff weather." 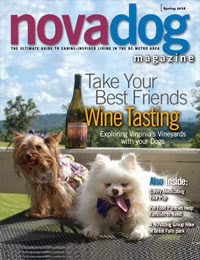 For those less than fond of soaring heat and humidity, the Wine Dogs suggest escaping to Virginia wine country and chilling out with a refreshing glass of wine. 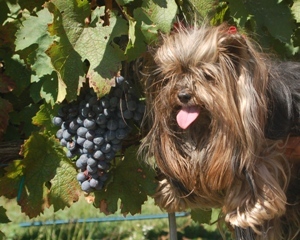 Several wineries have hosted special Dog Day events. 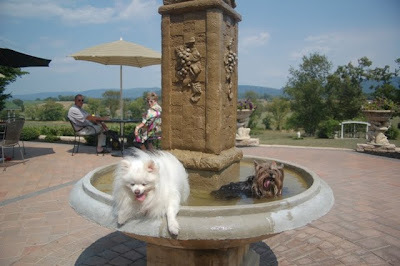 Last Sunday, Jim Bogaty invited hot dogs to Veramar Vineyards, and Munchkin and Pomeroy took the plunge. The previous weekend, Barrel Oak Winery really put on the dog, offering free tastings to anyone bringing a donations of dog food. 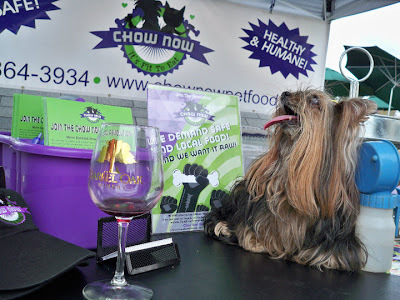 The generosity of BOW patrons wowed Munchkin, as they delivered enough food to fill 30 wine boxes (they were only 2/3 of the way done when she posed with the stash). 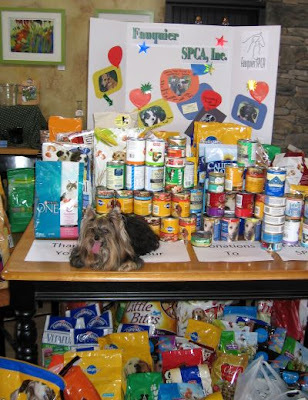 Although the donations went to the Fauquier County SPCA, Munchkin didn't leave hungry. 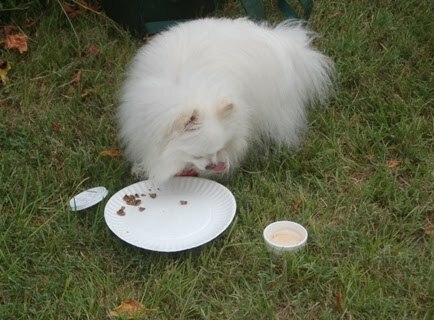 She enjoyed a generous array of treats from her friends at Chow Now. 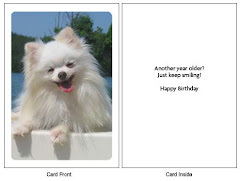 This coming Saturday offers two more Dog Days events for pups and people alike. 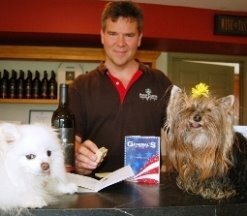 There's a Dog Days of Summer BBQ at DelFosse Winery starting at Noon. 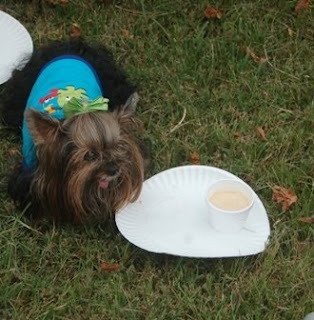 From 1-4, Three Fox is hosting the Fauquier SPCA and their “Paws for Refreshment” event. 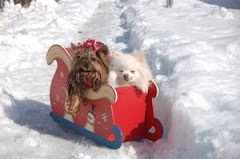 Munchkin and Pomeroy regret they are unable to attend. 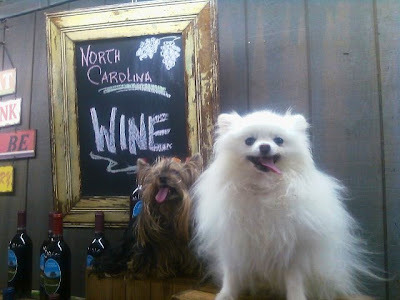 Virginia's favorite wine-loving doggie duo will be doing beach-time in North Carolina. It's a dog's life!